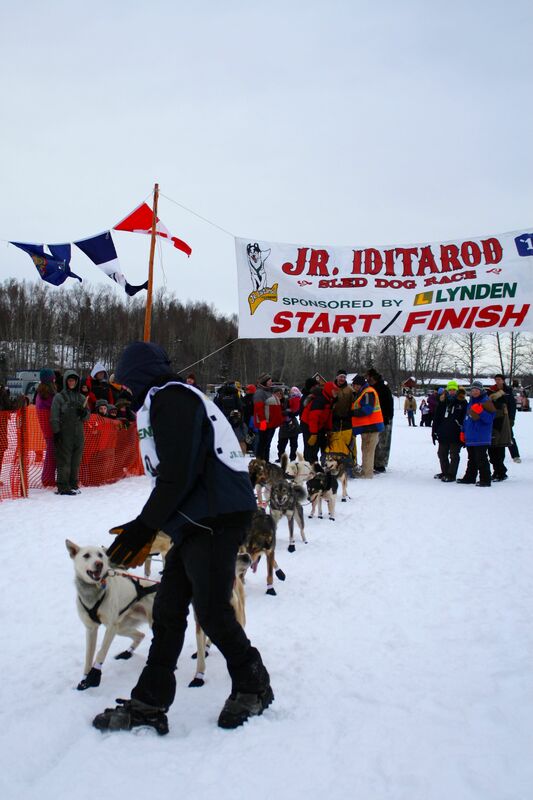 Snow woes have caused officials to reroute the Junior Iditarod set to start Saturday morning, Feb 22nd at 10:00. Much of the traditional trail the juniors follow out to the Yentna Station Roadhouse is ice covered and slippery, not surprising being that it runs on the area’s winter roadways – frozen rivers. By relocating both the start and finish line from Knik Lake further north to the Big Lake area, the Ten Teens will run on much better trail to the traditional layover at Yentna. Taking off from Martin Buser’s Happy Trails Kennel outside of Big Lake was a decision made by the Junior Board of Directors roughly a week ago. The length of the rerouted race course will be 124 miles. The field of Junior Iditarod Racers, all from Alaska, includes contestants from Willow, Wasilla, Sterling, Bethel, Nome and Chugiak. Of the Ten Teens, four are veterans and six are rookies, all with diverse interests and talents. Veterans include Ben Harper, Joshua Klejka, Jimmy Lanier, and former Junior Iditarod champion, Conway Seavey. Together they’ve accumulated eight years of Junior Iditarod experience. Harper, a high school senior is from Wasilla. He loves to hunt and upon graduating, he plans to head to college. Klejka comes from a long line of mushing siblings that includes two with Junior Iditarod gold. The Klejka’s are from Bethel where Joshua participates in cross-country, band, choir and drama. Lanier’s parents, Jim and Anna have both completed Iditarod so he comes quite naturally to sled runners. As a junior in high school Jimmy participates in choir and baseball. Seavey comes from three generations of mushers that include plenty of history, records and Iditarod gold. Aside from mushing, Conway, a home schooled junior, runs long distance, writes songs and sings. He won this year’s Alaska’s Got Talent competition. The rookie class for 2014 includes Jannelle Trowbridge, Nicole Forto, Ashley Guernsey, Joan Klejka, Andrew Nolan and Kevin Harper. Jannelle is a junior from Nome who serves on the student council, sings, likes to run and competes with the school’s biathlon team. Her first mushing experiences were with Greenlandic Huskies. Nicole’s experience with dogs goes beyond the sled pulling husky. The family operates Alaska Dog Works, a business specializing in training service dogs. When not training or running dogs, she plays softball on the Houston High team and enjoys guitar, piano and poetry. Ashley, the youngest contestant in this year’s race attends Seward Middle School. She’s a runner at heart participating in Track and Cross Country. Her hobbies include sewing, reading and writing. Ashley’s future goals include attending college and running the Iditarod. Joan, a sophomore from Bethel has been mushing with her brothers and sister since the age of four. She runs on the cross-country team and participates in choir and enjoys art. Andrew is a homeschooled sophomore who’s been mushing for about two years. He enjoys hunting and fishing and plans to work either construction or commercial fishing upon graduation from high school. Kevin, a student at Wasilla High is also a sophomore and enjoys snowmobiling, fishing, hunting in general but duck hunting specifically. There will be plenty of friendly rivalry out on the trail to Yentna Station and back between the contestants but also add the additional component of sibling rivalry. Two pairs of siblings will take to the trail on Saturday – Joan & Joshua Klejka and Kevin & Ben Harper. The junior mushers were required to complete their food drop bags by February 8th. 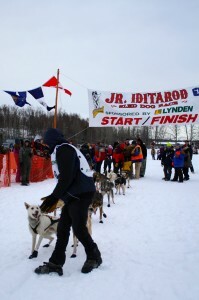 The six rookies will attend a rookie meeting at Iditarod Headquarters early in the evening on February 20th. Vets will check the canine athletes of the junior race at Headquarters on Friday and on the same evening all mushers and parents will attend the mandatory musher meeting. The race will start at 10:00 am out in Big Lake at Buser’s Happy Trails Kennels. Directions can be found on the Junior Iditarod website. God speed to all the junior mushers and race volunteers.